Hello, hello, come see me, I love meeting new people! My name is Edgar. I’m a very happy boy now, because I live in a house with my foster mom and two girl dogs. I love to play with them and we run and play in the yard, and then afterwards we cuddle up for a nap. I spent the first year and a half of my life in a cage, so this whole living in a house thing is new to me, and so are lots of other things. I can hardly remember the old days before As Good as Gold came for me. My new home will have to have a four legged friend to keep teaching me about the golden life and a fenced in yard. I love that my foster mom pets and scratches me, and we sometimes do this thing that she calls “training,” which means I get treats. I love treats! I retrieve balls, too–that’s a great game, but sometimes I forget that I’m supposed to give the ball to foster mom, and I run back and forth and up and down, chomping on it, so happy to be able to run and sniff the fresh air. But I always end up giving her the ball, because she always gives me–you guessed it, a treat! My foster mom says I am not a perfect boy yet, which is hard to believe, I know. I do like to chew on corners of things: a cushion, a picture frame, whatever is convenient, so I need supervision. But I also love my antler to chew on, so I’m easy to redirect. I am happy to go in my crate when foster mom leaves, because–yup, there is always a treat in there for me. As a healthy, young golden boy, I have been enrolled in a great program that will help people find causes for cancer in golden retrievers. 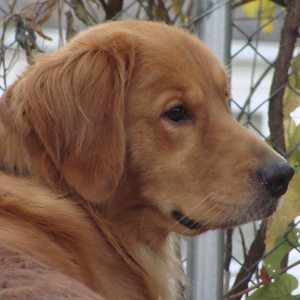 I will be given a Hero number and will need to go to the vet once a year with my new family to participate in the Morris Animal Foundation Golden Retriever Lifetime Study. I am excited to know that my enrollment in the study could help other dogs live longer and healthier lives. If you are the kind of person who is willing to help me be a hero, who will make sure I get some exercise every day to help me be a good boy, maybe I’m the dog for you!